The roadmap shows the significant missions (or outcomes) we currently expect to achieve between now and the end of the financial year, to improve GOV.UK and the service we provide to end users and our government colleagues. 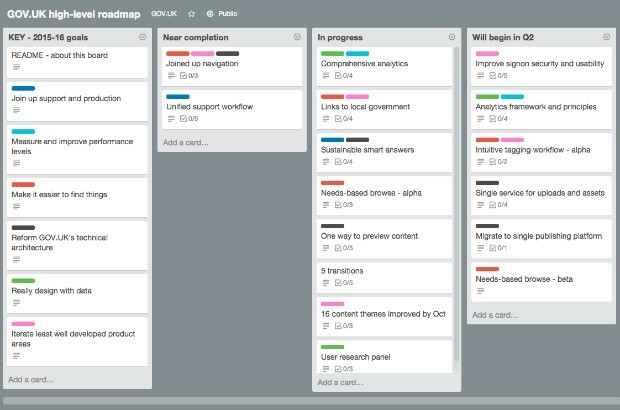 You can view the roadmap here, as a public Trello board. Each mission is colour-coded to show which goals it supports. Click on a mission to read about the challenge that needs to be addressed, and a definition of when it will be considered done. We'll add details of how we’re measuring the success of each mission, as they're worked on. The board will be updated at least fortnightly to reflect current progress and delivery expectations. It will be a true reflection of our intentions at any given time, but shouldn't be mistaken for a Gantt chart. Things change around us, and so our plans are agile. Items on the left are more certain than those on the right, and the roadmap as a whole will be thoroughly reviewed every quarter. For progress reports and nearer-term plans, at the more detailed level of features and content projects, stay tuned to our fortnightly "What we're working on" blog posts. In combination, the vision and goals, high-level roadmap, what we’re working on posts and team backlogs tell the full story of what we’re prioritising, at different levels of detail. We welcome any feedback, both on the substance of these plans and on how we’re communicating them. If working in the open like this appeals to you, take a look at Working for GDS – we’re often in search of talented people to come and join the team. I was quite excited to find this page and was looking forward to using the links to other areas, however the links to the Vision and the High Level Roadmap, unfortunately take you straight to the Standards and Guidelines Page which it has a separate link. It would be good if they took you to the right place. Please can this be arranged correctly please. I was interesting in this and whether you did any reporting from Trello. If you do is it done manually or can you run a report or export the infromation?